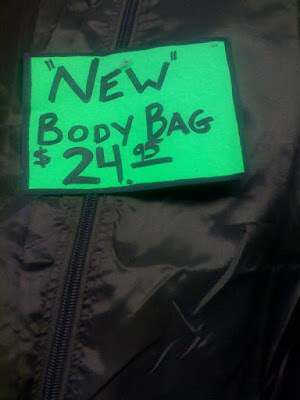 The “Blog” of “Unnecessary” Quotation Marks: used? Andrea found this at an army surplus store. Maybe it's only had LIVE bodies in it. So it's technically unused? I don't care if it is genuinely NEW, why would someone by this? Why in the world are they selling these???? Great find! Toep, you have no idea how bad people feel when they have to go collect a body, and people make fun of them because their bag is sooo last season. Wow, this might be the creepiest thing of all time. LOL @ Sam's comment.